Desperate times call for desperate measures. On the first Friday of Coachella, ordinary festivalgoers became amateur detectives after their cell phones were stolen. 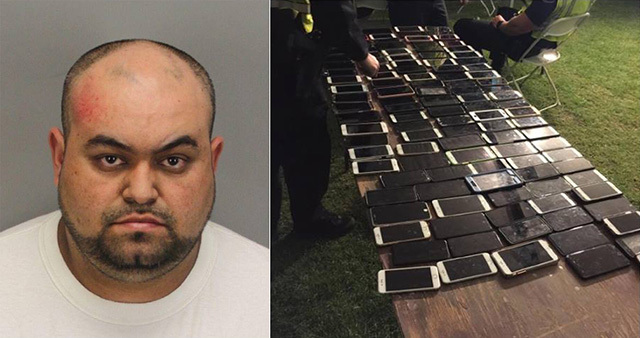 "Some people inside the venue noticed that their phones were missing, so they used the app, you know, Find My iPhone, or however they were tracking it," Indio Police Department public information officer Sergeant Dan Marshall told LAist. "Obviously, they weren&apos;t using their phone because their phone was gone." After activating the feature and locating their stolen phones, the tech-savvy festivalgoers followed the suspect around until he was detained by festival security workers, according to the L.A. Times. "Enough people pinpointed it to this person, they notified security, they looked around, they saw a person with a backpack, they detained him and then they called us," Marshall explained. "When we got there, we discovered these hundred-plus cellphones in his backpack." New York City resident Reinaldo De Jesus Henao, 36, was arrested and charged with possession of stolen property and grand theft, according to Marshall. Twenty of the phones have reportedly been reunited with their owners.